SAP® Pricing is one of the most flexible functionalities in the SAP system, but it’s also one of the most complex. Project team members and consultants alike avoid having to deal with Pricing. Why is that? Although the standard SAP documentation explains SAP’s individual Pricing capabilities, it does not clearly illustrate how the individual pieces connect as a whole. Pricing expert Matthias Liebich provides this missing link with The Ultimate SAP Pricing Guide. Through easy-to-read, step-by-step instructions, Matthias guides you through real-life business examples in how to use the SAP Pricing functionality. If you would like to get a better understanding of SAP Pricing and become a respected Pricing resource in your company or a sought-after Pricing consultant, The Ultimate SAP Pricing Guide is the right start for you. With over 18 years of SAP SD consulting experience to draw from, acquired during numerous full life cycle implementations in the US and Germany, there is hardly a pricing scenario Matthias has not seen. His hands-on experience in new implementations, upgrades, mergers, divestitures, and bolt-on integrations gives him the ideal background to explain the do’s and don’ts in the world of SAP Pricing. Matthias is a regular contributor to the ERPtips Journal. He is the owner of MLI Solutions, LLC, a provider of world-class SAP consulting services. 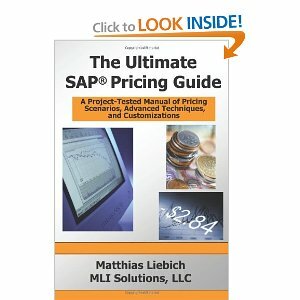 In his first book “The Ultimate SAP Pricing Guide”, Matthias Liebich tackles one of the SD modules’ most daunting topics with hands-on practical examples, detailed screen and field explanations, and words of caution to guide the reader. The book is written for the comfortable SAP user, and can easily be understood by those in business, functional or technical roles. Unlike other SAP instructional books, “The Ultimate SAP Pricing Guide” walks through pricing set up screen by screen and explains the “WHY” behind many of the features and icons in the IMG. He offers many details in SAP basics such as how to configure objects so as to avoid conflicts at time of upgrade. As a 15 year SD experienced consultant, I found myself caught off guard by the subtle details I had overlooked (or was completely unaware of) buried in the treasure chest that is Pricing Config. I intend to share this book with more Junior SAP consultants as a teaching tool to help with concepts such as Condition Technique, an often confusing method of determination that leaves many functional analysts holding their heads. The topic, once understood, branches far outside of Pricing and into the SD arena, and can be applied in concept to Output determination, Listings/Exclusion, and Material Determination. The challenge is in the mastery of Condition Technique, which is made easier with the help of “The Ultimate SAP Pricing Guide”, and provides a foundation that crosses over into other key areas of the module. Chapter 3 is, to me, the culmination of the essentials of pricing. Here the author addresses Pricing Analysis, to a level of detail that is invaluable to every level of SAP user. Pricing analysis in the sales document is the visual depiction of all that has been achieved through the configuration documented in prior steps. Within section 3.2, the reader sees the finished product where Mr. Liebich has pulled together a summary of the essential ingredients of SAP’s pricing procedure; technical enough to help an analyst troubleshoot their work, yet simple enough to facilitate any business user in understanding the pricing schema. The details in this chapter go far beyond the basics as they continue to break down application of the configuration and master data required to Reprice Documents, control Scales, utilize Group Conditions and other topics touched upon in previous chapters. In later chapters, “The Ultimate Guide to SAP Pricing” dives head first into advanced concept including Free of Charge, Sales promotions/Sales deals and Rebates, and finally custom modifications in pricing. While these topics are geared to the more experienced user, the author maintains his earlier strategy of providing the thorough but not overly technical detail so that the reader is able to follow along, and mirror the teachings of the author in their own SAP system. Where other SAP publications have been so lacking in specifics, “The Ultimate Guide to SAP Pricing” gives you step by step, screen shot rich examples that won’t leave you wondering what ISN’T being said. I keep asking myself as I read, “where was this book 10 years ago when I needed it so desperately”.